Colleen Holland (centre) is campaigning for State Government funding for Ulan Road, supported by (form left) Errol Grieve and Geoff Hawes of the Mudgee Rescue Squad, regular road user Deborah Sprigg and Hugh Bateman of the Property Shop. 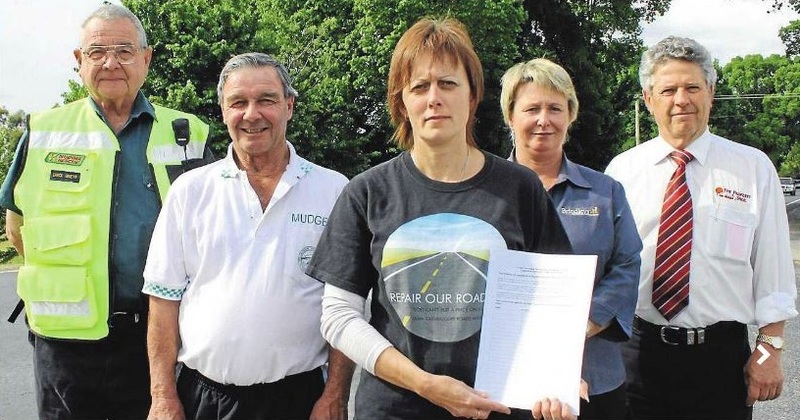 Mudgee resident Colleen Holland is calling on die region to get behind a push for State Government funding for Ulan Road and Cope Road. Mrs Holland hopes 10,000 people will sign the petition calling on the State Government to use funds allocated to mining affected com-munities to upgrade the roads and to act urgently to designate Ulan Road as a State Road. If 10,000 people sign the petition the issue will be debated in State Parliament. Mrs Holland said a previous petition signed by 4000 people had been used by Mid-Western Regional Council to support its push for funding for Ulan Road. According to a recent council report, Ulan Road is only fit to carry about 800 vehicles a day. The road is already used by more than 4000 vehicles a day and the number of vehicles has grown by 17 per cent a year. Mrs Holland said the question of funding for Ulan Road is important for the whole region, not only the residents, mine workers, school children, truck drivers, tourists and cyclists who use regularly the road. State Government funding of Ulan Road would free up Council funds to be spent on other areas of the region, she said. Mudgee Rescue Squad member Geoff Hawes and Errol Grieve are supporting the campaign to upgrade Ulan Road. Mid-Western Regional Council, Wilpinjong, Moolarben and Ulan Mines and the State Government have been negotiating for nearly two years on funding for Ulan Road. The cost of upgrading the whole road was estimated at $32 million in the first funding strategy prepared on behalf of the mines. The strategy recommended that council pay $16 million of the capital works cost – equivalent to 342 per cent of council’s capital roads budget for 2010/11. The most recent strategy, focusing on the worst sections of the road, costs the work at $21.5 million. Mudgee businessman Hugh Bateman said he was not sure that the State Government was aware of the dire need to upgrade Ulan Road.